Everyone loves a good party, but nobody likes the cleanup. That's where party disposables make parties great. They're perfect for any party and any setting. The best part is that no dishes need to be washed afterward. Simply toss out the party disposables - the plate, cups, plastic ware and even the disposable serving trays and food trays. You're planning a backyard barbecue, a Super Bowl party, a home wedding reception for dozens or even hundreds of people. You've got to set up food trays and serving platters that look nice, but you don't have enough good serving trays or food trays to fill the bill. Maybe you do have enough food trays and serving trays, but you don't want to pull out your good trays passed down from your great-grandmother to serve up Super Bowl snacks for that bunch of rowdy football fans in the living room, knowing full well how easily something could wind up chipped or broken. What do you do? 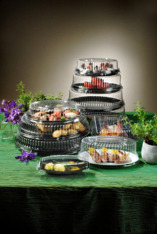 You could rent serving trays or food trays, but that gets costly in a big hurry. Disposable serving trays and food trays are the ideal solution. These party disposables now come in a variety of colors and patterns to fit into any party theme. Disposable serving trays and food trays also come in multiple sizes, making them convenient for a wide range of party foods or for any crowd capacity. What's more, disposable serving trays and food trays are priced to fit even the tightest budget. So the next time you're organizing a party, remember the disposable serving trays and food trays when purchasing your party disposables. They're convenient, affordable, stylish - and the cleanup is a snap. Cheers to a great party!